&Beyond's Group Training Chef, Dumi Ndlovu, and Group Hospitality Manager, Geoff O' Grady have created the menus for KLM Royal Dutch Airlines' Africa Experience, a celebration of the African continent that will run this Spring. Dumi's carefully selected African-inspired meals (from beef bobotie to ostrich potjie) will be sampled by over 700,000 economy class and 100,000 business class passengers on KLM intercontinental flights from Amsterdam to its African destinations that include Johannesburg, Cape Town and Nairobi. Each of Dumi's in-flight meals will be paired with Nederburg and Fourcroy Nederland wines. A video of Dumi cooking in the African bush will also be played on the flight (to view the video, please visit www.africaexperience.nl). H�tel Le Bristol Paris is delighted to announce that a third Michelin star has been awarded to Head Chef Eric Frechon; the latest accolade in a lifetime of gourmet achievements. Eric�s culinary career started at just seventeen years of age when he joined Jean Sabine�s team at �La Grande Cascade� in Paris from his town of Treport in Normandy. He then trained alongside the most noteworthy chefs in Paris, including Emile Tabourdiau at H�tel Le Bristol - his future base - and Claude Deligne�s team at �Taillevent�, where he was promoted from apprentice to Chef de Partie. After two years spent honing his culinary skills at �Taillevent�, he embarked on a new adventure in Spain to assist Chef Patrick Bausier (whom he had met at H�tel Le Bristol) at �Le Byblos Andaluz� in Malaga. After returning to Paris two years later, he worked at the celebrated Parisian establishments �La Tour d�Argent� and �L�H�tel Crillon� where he was based for seven years and appointed Head Chef. In 1996, he opened his own restaurant, �La Verri�re�, in the 19th district of Paris to much critical acclaim and returned to H�tel Le Bristol as Head Chef in 1999. He won a second Michelin star for the hotel in 2001. In 2008 Eric was awarded both the �3-Star Espoir� a preliminary honor to the coveted three Michelin star, and the Legion d�Honneur which firmly cemented his status as a national treasure. Eric sites his rural upbringing in Normandy and his family as the major influences behind his passion for food and the love of natural produce, commenting: �my grandfather cultivated vegetables, my father sold them [vegetables]�and I cook them�. He likens his style and creative process to that of a designer creating Haute Couture. Eric is delighted and immensely proud to share this achievement with his team of 80 at H�tel Le Bristol, an icon of art and refined taste in the French capital, and where he flourished to obtain a third Michelin star for the restaurant. H�tel Le Bristol is one of Paris� most legendary �Palace� hotels. Changing seasonally, the Winter Restaurant offers guests the warmth of oak woodwork and the Summer Restaurant opens onto magnolia and Wisteria off the courtyard garden. Le Bristol�s �3 stars� Chef Eric Frechon revisits the basics of French Cuisine with style. The hotel is also home to an Anne S�monin Beauty Salon and a rooftop pool with spectacular views over Paris. H�tel le Bristol is set to unveil in 2009, an additional 21 rooms and five suites as well as a grill restaurant. The hottest new chefs tool is a knife with two edges that does it all. The Japanese steel blade stays super sharp and it is nonstick. 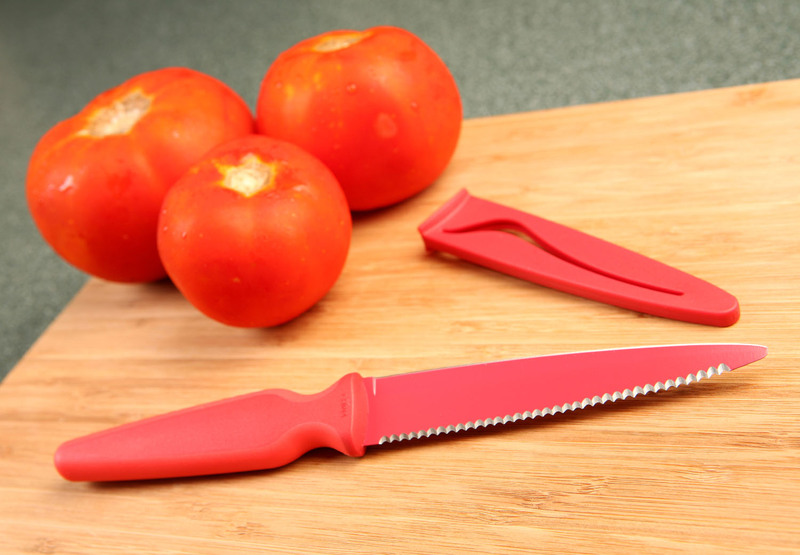 A double edge serrated edge cuts bread and tomatoes. The smooth edge slices meats and vegetables with ease. This attractive cooking essential was created by award-winning Swiss designer hilipp Beyeler. It is the number # Swiss Brand of Cookware and Cooks' tools. For additional information visit: KuhnRikon.com.